Everything about our lives is influenced by design, whether it is the offices that we work in or the clothes that we wear – someone, somewhere has taken a vision and made it reality. Design appears in all industries from fashion to architecture and art to furniture but one of the most affluent areas of contemporary design has to be that of Ceramics. 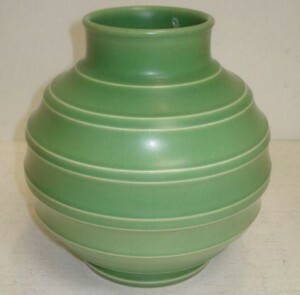 Pictured right: Keith Murray for Wedgwood: a green glazed bomb shape vase, 20cm. Sold for £125 at Bonhams, Oxford, 2012. 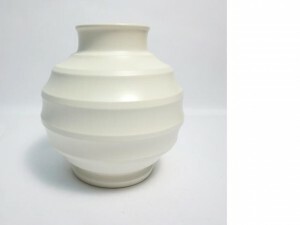 The Art Deco period erupted in an explosion of colour and geometric shapes with female designers such as Clarice Cliff and Susie Cooper at the helm, but there was one man, so ahead of his time, that although his pieces were created in the 1930s they sit just as well in any display cabinet today. Keith Murray’s simplistic modernist designs are not only sought after but are proof that the Art Deco period was responsible for some of the most innovative designs of our time. Born Keith Day Pearce Murray in Auckland, New Zealand on 5th July 1892, he originally trained as an architect in London. However, after qualifying he found it difficult to obtain work so instead started to sketch illustrations for an architectural magazine. It was on his travels sketching buildings that he visited Paris and discovered the beautiful French and Scandinavian glass. Realising that he too, could produce designs for glass he approached Arthur Marriott Powell of the Whitefriars Glass factory in London with his ideas. Unfortunately Powell didn’t find them suitable for the factory and so couldn’t offer Murray work. Refusing to give up he landed himself a freelance position with ‘Stevens and Willams’ at Royal Brierley Crystal where he produced over 1200 stunning designs in glass between 1932 and 1939 with Cactus being his most recognised design. Although Murray was a highly accomplished glass designer, it is his designs in ceramics that command high prices today and are eagerly collected. 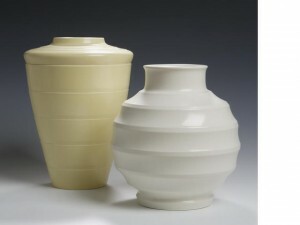 Pictured right: Keith Murray A Wedgwood cream glazed vase – sold for £470 (inc premium) and a Keith Murray A Wedgwood moonstone vase – sold for £352 (inc premium) at Bonhams, Edinburgh, 2006. Murray’s ceramics career started when Josiah Wedgwood invited him to visit the Wedgwood Factory. He was then employed to produce designs for dinner and teaware. It is here that Murray’s famous ribbing designs began to form and today these early pieces can fetch unbelievable prices on the secondary market. The first range that Murray worked on was titled ‘Annular’, and working alongside Tom Wedgwood he helped finalise this range. Murray then took his inspiration from the Annular range to produce other pieces, which included vases and bowls. Murray’s work was also heavily influenced by his architectural background; rather than heavily decorated pieces like Clarice Cliff and Susie Cooper each piece was stylised, so visually more distinctive by shape and form. The technique used was very simple; the throwers created the basic shape and then lathe-turned the item to create the ribbing. This was a technique that Wedgwood had used in the 19th Century and it worked well on Murray’s more modernist designs. Once a piece had been made it was then decorated in high quality monochrome glazes, which were originally created by Norman Wilson when he joined Wedgwood in 1927. The glaze finish was another distinctive feature of Murray’s work because each piece was matt, semi-matt or celadon and not the usual high gloss glazes that you see on earthenware pieces today. Colours ranged from matt green to moonstone and there are even black pieces available on the market, these being extremely desirable as they are rarer than the other colours. Pictured left: Keith Murray, Football Vase. Image Copyright Bonhams. The most collected of Murray’s designs from this period are the clean, crisp engine –turned fluted vases (1930), they fetch around £500- £800 on the secondary market. A Bulbous ribbed vase (1932) can realise £800 to £900 and a matt green desk (1932) set would set you back in the region of £1,000 to £1,500. Although the prices are starting to hit the same dizzy heights as Clarice Cliff’s designs you can still pick up good examples at reasonable prices. A small matt green sweet dish (1932) would only cost around £40-£50 and the same for a cup and saucer. If you decided to collect Murray’s work you will soon realise that it is easily recognisable as it stands out from any other piece from this period. Early pieces always bear Keith Murray’s signature above the Wedgwood mark and this was used from 1933 onwards. On smaller pieces it was difficult to use the full Murray signature so the letters “KM” were used instead. Murray’s designs proved a sensational hit so in 1933 he exhibited his work at the John Lewis Store in London. His work was beginning to show in Wedgwood’s annual turnover so he was then asked to diversify and produce some decorative tableware patterns. Murray agreed, although he did not like the intricate patterns that he had to produce, as he was a designer to the core and preferred to work with shapes rather than paint patterns. The tableware patterns that he designed are not as sought after by collectors but they may well be in the future so look for patterns such as ‘Weeping Willow’ and ‘Pink Flower’ because not only are they more affordable, they could raise in value in years to come. Murray continued to design in earthenware and glass but in 1934 the Royal Silversmiths Mappin and Webb approached him and asked if he could produce bowls and vases in silver working to the same designs as his Wedgwood pieces. One of his most successful Wedgwood items was a beer mug and this was reproduced in silver for Mappin and Webb. By 1936 The Royal Society of Arts had awarded Murray as a Royal Designer for the Industry because of his professional achievements and he even went on to set up his own architectural practice. Unfortunately the outbreak of war put a stop to most ceramic production in England and so Murray joined the war effort working at a desk job before continuing his career after the war. In 1945 he was made Master of the Faculty of Royal Designers for Industry and could once again concentrate on working for Wedgwood and building up his architectural practice. By the 1950s Murray’s designers were not so highly demanded; although they had been extremely popular in the 1930s people felt that they were too modernist and architectural by the 1950s. 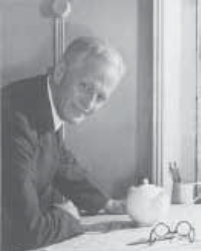 However, Sir Arthur Bryan, the Wedgwood Chairman, requested that some of Murray’s 1930s shapes were re-introduced to production because he was not happy with the shapes being made in the factory. These Murray designs were made in bone china and used for some considerable time, right up to the 1980s. Keith Murray passed away in 1981, aged 89. His life had been a catalogue of achievements spanning a thirty-year period. He was an accomplished designer of glass, ceramic and silver, not forgetting to mention the buildings that he designed after setting up his architectural practice. It is because of these achievements that he is classed as one of our most prolific and iconic designers of the 20th Century. It was Murray’s vision to produce something so ahead of its time. He certainly succeeded in turning this vision into reality without considering that his contemporary pieces were going to be just as popular in our modern world as they were when he first created them. Snowstorms, Snow Globes, Snow Shakers, Snow Domes Oh My!